Robert Youngston’s When Comedy Was King (1960) played the Uptown Theatre in Napa and featured the antics of Charlie Chaplin, among others. I didn’t know one could laugh so hard. That’s when I realized there was a history to the movies. Starved for more, I couldn’t believe my pre-teen eyes when Silents Please appeared on TV with 25-minute versions of the great silent movies. Another TV show, Fractured Flickers (1963) used clips from mostly silent movies with a new narration for comic effect created by Jay Ward (Rocky and Bullwinkle). It ran for one season and while purists have criticized it, the show provided developing cineastes images we hungered to see. The local Town & Country Fair has a youth costume contest and parade each summer. I went in my own creations, once in drag as the faux 20’s bathing beauty “Miss Take,” and another year as “The Jokerman from Outer Space”; but, the best reaction was when I came as Chaplin’s Tramp. When I was about 12 my parents gave me the hayloft in our barn in rural Napa. I made a monster movie and decided to show it on the set in the barn. We put up a sheet and made a booth for the 8mm projectors. It was so much fun that I decided to show movies regularly and learned that I could rent silent classics from Cooper’s Films in Chicago, programming a regular series with a feature film and several shorts showcasing both well-known heroes and obscure performers from the silent era, each film accompanied by music selected from the family record collection. Sometimes it didn’t work, but most of the time luck was on my side and compliments flowed. The Above-The-Ground Theatre was on its way. Chaplin’s on-screen debut as “the Tramp” was part of our first program with Kid Auto Races At Venice . Many other Chaplin short films and a few early features followed. You could buy prints of many silent films from companies like the wonderful Blackhawk Films. When Cooper’s sent a new selection of films to rent The Gold Rush was a featured selection and I immediately booked it. It included a musical score written by Chaplin on a separate audio tape. How exciting. When the print arrived I immediately set up the projector and tape recorder to check it out. The music was created by Chaplin for his reissued “definitive” version in 1942. The score is fine if a bit repetitive but to my surprise and disappointment it also had a high-pitched whiny narration by Chaplin. The intertitles were removed and Chaplin told us what was going to happen next, eliminating all surprises. Because the soundtrack was to be played at 24 frames per second but the version of the film I got was the silent one intended to be screened at about 18fps, they were totally out of sync which made it easy for me to decide I would start finding good music from the record collection. Both versions are on the Criterion Collection Blu-Ray/DVD set. As interest grew, several of Chaplin’s classic features enjoyed theatrical reissues with music he composed. It was my chance to experience them with a large audience in real cinemas. It also resulted in some strange parings such as the Fairfield Theater doublebill of The Great Dictator with Dr. Goldfoot and the Bikini Machine . When Tony Bennett hit it big in 1962 singing “I Left My Heart in San Francisco”, we bought the album and I noticed one song was written by Charles Chaplin, “Smile,” the tune created for Modern Times (1936). In the mid-1960s a group of silent film lovers started presenting classics in 35mm on the big screen at San Francisco’s Avenue Theater every weekend with Mighty Wurlitzer accompaniment by Bob Vaughn and others. They were the first place to show the three-screen Napoleon by Abel Gance, which came nearly full-circle last year when the SF Silent Film Festival presented it at the Paramount. Chaplin was a regular visitor on the Avenue screen. We drove up to the house, a bit nervous about this quest now that we’d found it. I knocked on the door and soon a woman answered. It was his wife, Oona. She was welcoming but explained that Charlie was not feeling well and was taking a nap. “If you come this way again please stop by. 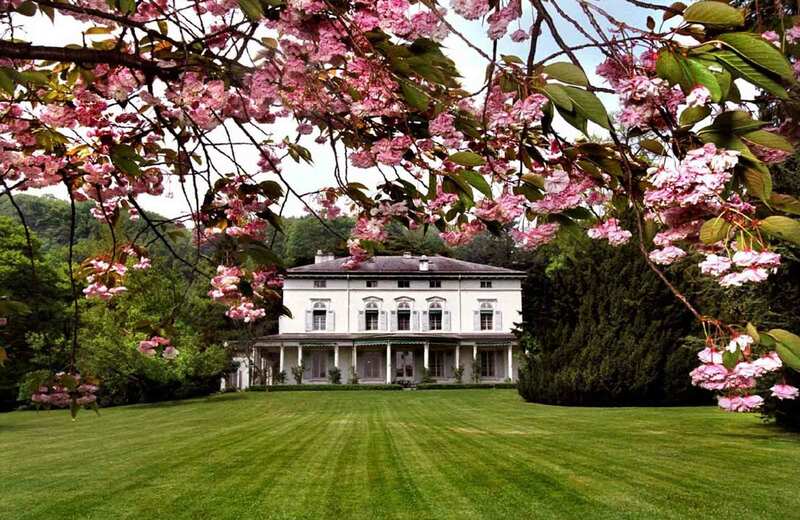 I am sure he would love to meet you.” I could hardly believe it and the following April we made a detour back to Vevey. This time someone else answered the door, sorry to report that I had just missed Mr. Chaplin who left that morning to get his special Oscar® in Hollywood. 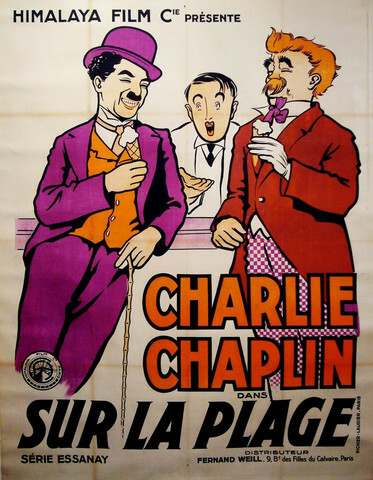 On that trip I came across several Chaplin posters. He was popular everywhere in the world with reissues of his films in many places. Movie posters had not yet become collectibles and I got lucky buying a prize 1920s French version of By the Sea at a flea market. When I co-founded Landmark Theatres in 1975, Chaplin movies were a popular fixture in our repertory programming. At Berkeley’s UC Theatre and later at the Balboa in San Francisco we annually celebrated the theaters’ birthdays by recreating a night at the silent movies with live music, often featuring Charlie on the screen and impersonators in our lobby. Showing A Jitney Elopement and In the Park at the Balboa was especially fun because they were filmed a few blocks away from the theater. Werner Herzog came to the U.C. Theatre in 1978, keeping a promise when he challenged UC student Errol Morris that he would eat his boots at the world premiere of the movie Errol talked about making, Gates of Heaven . Les Blank was there to film the event and asked me, as program director of the theater, to comment on what Werner was about to do. I made reference to Chaplin doing the very same thing in The Gold Rush. Les’ resulting film was Werner Herzog Eats His Shoe. My scene made the final cut. I have been lucky to have met the children of Oona O’Neill and Charles Chaplin, Geraldine and Michael and seen his granddaughter Aurélia Thierrée perform her show Aurélia’s Oratorio directed by her mother Victoria at the Berkeley Repertory Theatre. They all enjoyed my story about visiting Vevey. Through the years at various film festivals I was lucky enough to spend time with the British film critic David Robinson whose book Chaplin: His Life and Art is for me the definitive biography and Robinson generously shared stories about the master. In 2007 Norman Lloyd made his first visit to the Telluride Film Festival where I was lucky enough to become friends with the now 100 year-old actor/director/producer. 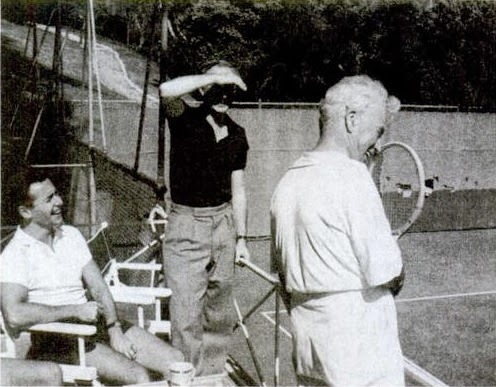 He told how he was invited to play tennis with Chaplin. They became friends and Lloyd was featured in Limelight. Over the years he has told me wonderful stories about Chaplin. His long interview about Limelight at the 2015 TCM Festival will be shown on Turner Classic Movies soon. Mark Stock was a renaissance man (painter, golfer, jazz musician, composer, magician, chef, acrobat, etc) in love with Hollywood, especially film noir and Chaplin. 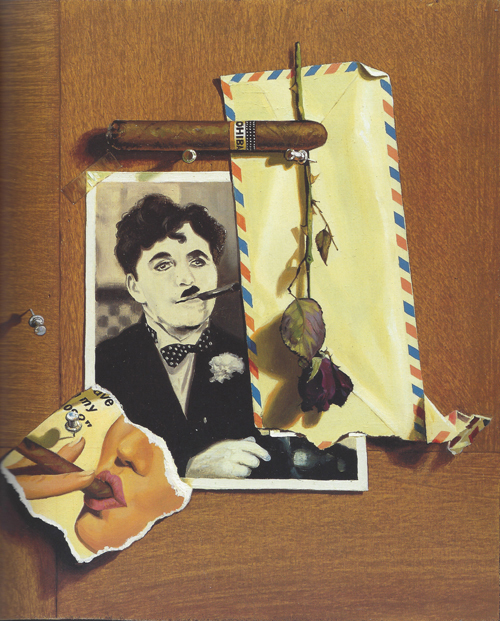 “The Artist of the Twentieth Century” painted by Mark Stock, 1996. 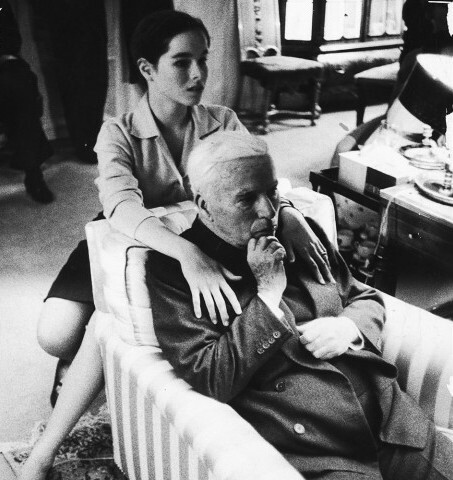 One night at dinner as we compared our love for Chaplin he told me about a banquet he arranged in Los Angeles where he tracked down and invited every living person who had known or worked with the legendary filmmaker. Mark passed away on March 26, 2014 of a sudden heart attack returning from signing film noir posters he created for the Roxie Theatre. He left a wonderful legacy but many wonder what stories he had yet to tell. 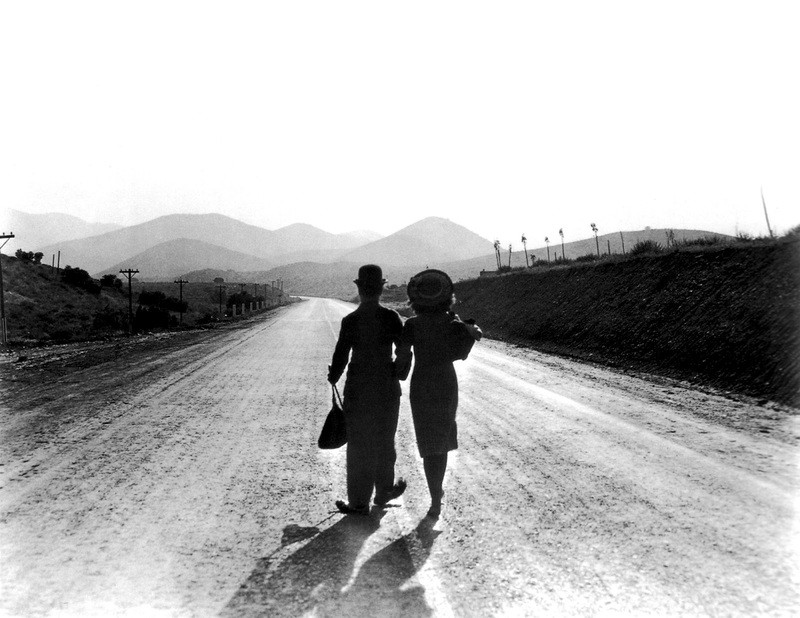 In the Bay Area we are indeed lucky that there are many chances to understand why Chaplin and many other silent movies were not those speeded up, jerky images so many people associate with silent movies. I would suggest there are more silent movies screened with live music here than anywhere in the U.S. With the San Francisco Silent Film Festival, Niles Silent Film Museum, the Pacific Film Archives, Smith Rafael Theatre, the Stanford Theatre and special events presented by various film festivals and cinemas like the Paramount in Oakland and even the San Francisco Symphony, there are many chances for you to become a convert if you are not already. Thanks Charlie, for enriching our lives. Read about how You Can Be a Chaplin This Weekend in the Charlie Chaplin Days at Niles, California. 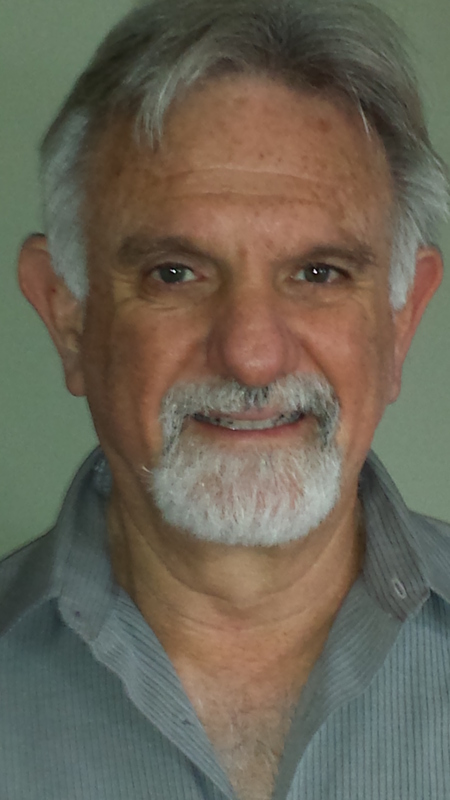 This entry was posted in Films and tagged Charlie Chaplin, Films, Mark Stock. Bookmark the permalink.